The new way of life seems to be more technology and technology based devices. This is no different for your home. The new wave of smart homes is allowing home value to soar and modern conveniences to allow for a different more desirable lifestyle. 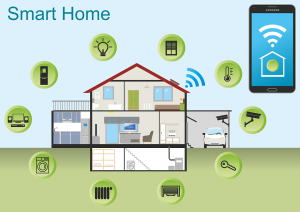 The new surge of smart homes becoming available is tremendous. The convenience this allows has been a phenomenal way for most people to live a more relaxed way of life. Advantages include the ability to control all of your home features from your smart device. You can have automatic locks eliminating the use of keys and allowing entry only of those that have the code or whom are allowed to enter by your finger swipe on your phone. You no longer have to worry about the kids losing their keys at school or leaving a key with your neighbor when you are gone eliminating their full access to your home and all of your belongings unsupervised. You can turn your appliances off and on from your phone. You can even have your oven begin to preheat before you get home speeding up the time it takes to cook a meal for your family. You can control your home’s temperature according to how the weather of the day goes because we all know how wrong our local meteorologist can be at times. This also allows for you to control your lights and such so that the cost of your utilities dramatically decreases and helps the environment by only using what is necessary. You can monitor your children and your pets while you are away. You can be alerted when someone tries to enter your home. Your lights can be controlled from one central device or from your smartphone so you never enter a dark house or room. You can turn the lights on for your children when they come home and you can even automate your locks so that only those you trust have legal access to your home, family, and belongings. Yes the cost may seem to be too much for you, but the truth is you will see a dramatic decrease in your utility bills, and your time which is valuable will once again be yours to do as you want instead of having to worry about the mundane chores of running your home.